I really wanted to start my blog off with a beautiful photo. I am currently in love with this picture. 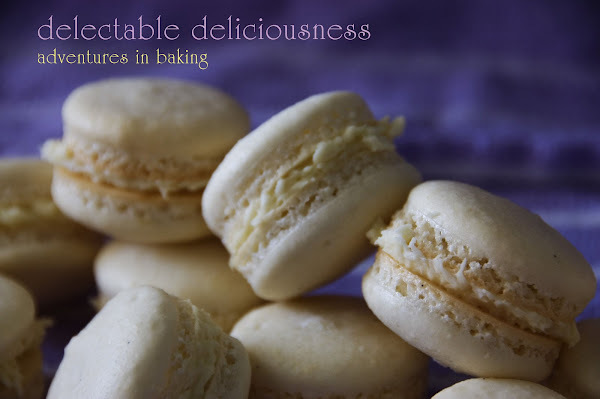 Mostly because a. I took it and b. I also made those gorgeous, yummy macarons in said photo. I'm quite proud of myself, especially for the latter. The recipe I used can be found here on Cannelle et Vanille. Aran needs no introduction, as I'm sure if you've found your way here, you've certainly passed through her amazing, drool worthy blog. 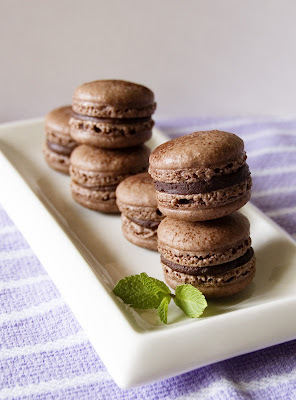 This particular recipe for chocolate macarons has worked every single time for me that I've tried it. I filled them with a simple bittersweet chocolate ganache flavored with a hint of frangelico liqueur. I used equal parts (by weight) chocolate and whipping cream, replacing one tablespoon of the whipping cream with the frangelico. More macaron musings to come, in the meantime, feel free to drool over the photo. They are so cute and pretty! The photo is gorgeous! Congratulations! I'd love to include it in my list of the best food photos of the week! Just follow this link and leave a link to this post in the comments section of the post. Keep taking those gorgeous shots! Yum. They look so delightful! Ina, I'm not sure what the secret is. I thought I had mastered the macaron, but just this past weekend I made a batch of regular macarons and they all cracked. I'm thinking it might be the food coloring I used in them - I used an all natural liquid food coloring made from beets. The last time I used that same food coloring my macarons cracked as well. ps powder color work better than liquid, I think.